This revolutionary text and its accompanying CD replace a whole lab full of computer equipment. They give computer science students realistic hands-on experience working with network protocols, without requiring all the routers, switches, hubs, and PCs of an actual network. Using the latest version of the open source program Ethereal, the reader opens packet trace files from the CD and follows the text to perform the exercises, gaining a thorough understanding of the material in the best way possible—by seeing it in action. This approach also benefits the instructor, who is spared the time-consuming tasks of maintaining a laboratory and taking traces. It can even relieve the anxiety system administrators have about students collecting traces on campus networks! 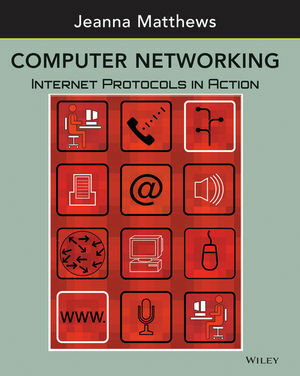 Jeanna Matthews is the author of Computer Networking: Internet Protocols in Action, published by Wiley. 1.1 Examining a Quiet Network with Ethereal. 1.3 Examining a Busy Network Using Filters. Section 2: Application Layer Protocols. 2.1 Under the Hood of HTTP. 2.2 HTTP Caching, Authorization and Cookies. 2.4 Sending and Receiving Email with SMTP and POP. Section 3: Transport Layer Protocols. 3.3 Comparing TCP to UDP. 3.4 Competing TCP and UDP Streams. Section 4: Network Layer Protocols. 4.1 Joining the Internet: Introduction to IP and DHCP. 4.3 Dynamic Routing with RIP. Section 5: Link Layer Protocols. 6.2 IP Spoofing and TCP Session Stealing. Practicality: Students are able to learn by doing without having to use actual networks, while instructors are freed from the job of collecting the materials. Flexibility: Has been used successfully with students at the graduate and undergraduate levels. Appropriate for courses regardless of whether the instructor uses a bottom-up or a top-down approach. Completeness: The exercises take the student from the basics of examining quiet and busy networks—through application, transport, network, and link layers—to the crucial issues of network security.